Our contemporary curved gold plated letter opener will add a touch of class to any desk. At 8 1/2 inches long, this professional looking curved letter opener is packaged in a box. Need an engraved gold letter opener? 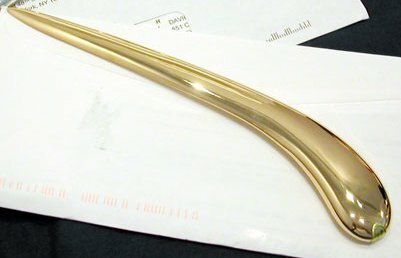 Our gold plated letter opener is available with or without engraving. We engrave EXACTLY what we receive. Please check for spelling, punctuation, and grammar errors! Enter the initials in the order you wish them to appear. We do NOT switch around letters. Please select a font to use for the engraving. At EngravingShop.com, we don't inflate our prices just to advertise "free" engraving. We offer fantastic item prices and competitive engraving. We custom engrave each piece, so we offer you more engraving choices on each item. Simply pick the engraving options you want at the price level you desire. Best of all, if you don't need engraving, you don't pay for it. See engraving prices when you select a font above. To see our fonts, visit our Engraving Styles And Fonts page. Please call 785-621-2730 with questions.